A mixed-traffic streetcar isn’t the way to go, but initial word from the Friends of the Brooklyn Queens Connector is promising. For a few hours, at least, Gov. Andrew Cuomo’s infrastructure improvement tour is on hold. Thursday’s announcement concerned the Javits Center, and I’ve learned that he’s going to announce a series of technology-related upgrades, including B Division countdown clocks, for the subways on Friday morning live from the Transit Museum. I don’t know if this announcement is in addition to ongoing MTA efforts to bring this technology to fruition or if the timeline for even a Cuomo project will still be 3-5 years as it’s been for the past five years. We’ll find out soon enough. Meanwhile, the pause in this tour allows us a chance to examine another story regarding New York City transportation that nearly sneaked in under the radar this week. A few months after hearing about what one person called a “cool idea” to initiate a waterfront streetcar that would connect Brooklyn and Queens, word of the behind-the-scenes consultant work leaked to the Daily News, and we now have an understanding of what one routing for a $1.7 billion streetcar may be. I’ve learned that this is one proposal being examined, and it’s not yet finalized or even exclusive. It can still be revised and amended, and the final suggestion may look different. But here goes. As Dan Rivoli reported earlier this week, consultants hired by the Friends of the Brooklyn Queens Connector have identified a 17-mile corridor that could support a light rail line running. The group believes it would connect growing job centers such as Industry City and Dumbo with residential areas such as Red Hook that do not currently enjoy particularly efficient or robust transit options. The route would start near the Brooklyn Army Terminal, pass by Industry City, journey to DUMBO via Red Hook, swing past the Navy Yards and waterfront development in Williamsburg before crossing into Long Island City and terminating in Astoria Cove. Connecting Sunset Park with DUMBO, Long Island City and Astoria could bridge a current transit gap. A study commissioned for a nonprofit called the Friends of the Brooklyn Queens Connector — whose members include transit experts, community leaders and business giants like Doug Steiner of Steiner Studios, investor Fred Wilson of Union Square Ventures and Helena Durst of the Durst Organization real estate firm — envisions sleek streetcars zipping through 10 neighborhoods along the 17-mile stretch of waterfront land between Sunset Park and Astoria. The Brooklyn Queens Connector is aimed at linking neighborhoods to new job hubs outside of the Manhattan-centric subway system as the waterfront adds new residential buildings and office space. The study estimates 15.8 million passengers a year in 2035. “Too much of the city is underserved by our transit system, and we need to be looking at ideas like this to create a 21st century network,” said Jill Eisenhard, director of the Red Hook Initiative community group and a member of the nonprofit supporting a tram. Mitchell Moss, director of NYU’s Rudin Center for Transportation Policy and Management, said the Brooklyn waterfront is going through a “renaissance” but needs better transit options to spread the benefits. “This is a brilliant way to tie together several different areas, which offer jobs, which offer housing, which offer recreation,” said Moss, who is unaffiliated with the group. The immediate issues I see with this proposal include the approach to service and funding. First, despite the renderings, anything we consider for the waterfront should not be a mixed-traffic streetcar. If the city, or private interests, plans to invest in light rail, it should be a light rail system with a fully dedicated right of way. It should also integrate with the MTA’s fare payment system so the city isn’t instituting a two-fare system as they’ve done with their ferry network. Already, I’ve seen some backlash to this project. Some have argued that transit development through Sunset Park and Red Hook will increase property value and lead to gentrification which pushes out current residents. This is a slippery slope of an argument that maintains areas attract poorer residents because transit options are lacking but that we cannot invest in transit because transit will lead to value growth that pushes out these poorer residents. I don’t like this argument and believe it plays into my stance that affordable housing has to include transit development. In other words, it’s up to the city to improve transit and maintain affordable housing so people can continue to live where they live but still get around the city. The second issue is one of need. When this project first bubbled up, I was skeptical. It seemed duplicative of the G train and targeted to wealth New Yorkers who could afford to buy up waterfront property. With an extension to Sunset Park and a routing closer to subsidized housing in Red Hook, the current proposal begins to address some of the issues I had with this plan when it was, as one proponent noted, just a “cool idea.” It connects growing job centers with residential areas in ways the current system doesn’t. Whether it’s a good use of $1.7 billion — or whether it should even cost $1.7 billion — is an open question. So what we have here then is the start of a potentially good idea. The consultant report won’t be released publicly yet in full, and it’s not clear what the Friends of the Brooklyn Queens Connector will do yet. Someone will have to identify a proper plan and fight for it, and that’s a tall order a time when our governor is running around announcing pet projects and the mayor can’t be bothered with the details of a much-needed transit expansion. The new transfer between the 3 and L in Brownsville shows that transit matters. In the MTA’s original 2015-2019 Capital Plan, New York City seemed oddly underrepresented. The Second Ave. Subway had a big pot of money coming its way, but while the investment in Transit was steep, the benefits were behind the scenes. Such is the nature of a system in need of modernization, but in the revised 2015-2019 Capital Plan, certain improvements are more obvious. One of those upgrades comes to us on the border of East New York and Brownsville, where the 3 train and the L train cross. As a remnant of history, the L train at Livonia Ave. and the 3 train at Junius St. cross, but there’s no transfer. You can think early-to-mid 1900s New York City politics for that quirk of the subway system, and this spot has long been one of the most obviously lacking transfer points. For years, East New York and Brownsville residents have clamored for the transfer, and early this year, politicians renewed their calls for the MTA to correct this oversight. According to the capital plan documents, the transfer will be built out in 2018 and is part of the MTA’s accessibility efforts. The agency will spend $15 million on ADA upgrades and $30 million on an in-system transfer between the two stations. Perhaps a free out-of-system transfer would be cheaper, but $30 million is a rounding error in a $28 billion capital plan. It’s well worth the psychological impact of the work. Random people on the B38 are bonding with each other over the upcoming 3/L transfer. By investing in areas that don’t often see transit improvements, the MTA can send a message that transit matters. This move can get New Yorkers out of their cars and onto the subway. It can lead to an embrace of transit as something responsive to people’s needs and as something that can improve lives. These aren’t the busiest of stations, but it’s a need that has long been obvious. It’s also something that city residents shouldn’t have to fight this hard to see become a reality. Across New York, there are a few other obvious transfer points that could yield benefits in the form of convenienced riders without a significant corresponding drop in revenue. I’m sure those who wish for a similarly obvious connection between the G and the J/M/Z in South Williamsburg are awfully jealous, and they have every reason to be. These minor but important upgrades simply shouldn’t take years to realize. Following Thursday’s G train derailment, the MTA restored full service to the line by mid-afternoon on Friday, and then the fighting began. I’ll have much more on this next week, but in announcing restored service, MTA CEO and Chair Tom Prendergast let loose on the city and Mayor de Blasio for their lack of support for MTA financing. Earlier in the day, TWU President John Samuelsen had issued a similar statement asking the city to pay more. Clearly, Gov. Cuomo had sent his allies to put pressure on New York City. Whether NYC should fund more of a state agency’s capital plan has become a hotly contested debate of late. More, as I mentioned, next week. Until late last night, the MTA’s website had barely any mention of the opening of the 7 line extension stop at 34th Street, and it seemed weird. They should be plastering everything they own with this news, but they could be wary about drawing too much attention to the 21-month delay. Still, the 7 line is opening at 1 p.m. Sunday, and it’s the MTA’s first new subway stop in a generation. I’ll be on hand earlier in the day with photos. Be sure to check out my Instagram and Twitter accounts for updates. Unfortunately, Transit Wireless was unable to complete service installation for day 1. So the new station won’t be wired. I’ll have updates as soon as I have cell service. For recent coverage of the 7 train extension, check out my posts. I look at the long lost stop at 41st and 10th, the now-bisected lower level at 42nd St. and 8th, the messy updates to the map, and future extensions to Chelsea or New Jersey. 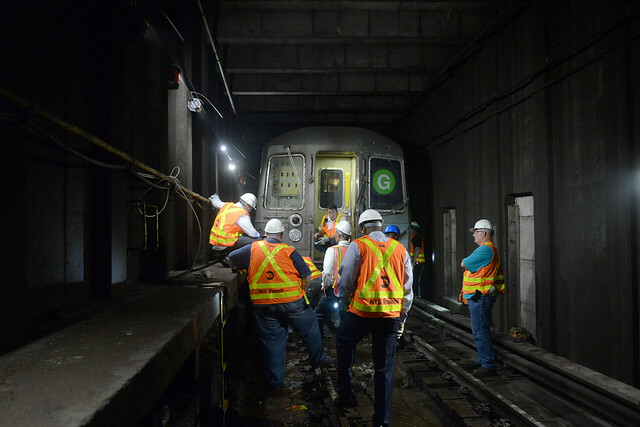 A southbound G train derailed around 700 feet north of Hoyt-Schermerhorn Sts. at around 10:35 p.m. last night. The FDNY reported three injuries, though none serious, and approximately 80 passengers — a fairly empty late-night train — had to be evacuated. The MTA has said that the front two wheels of the first car jumped the track. As a result of the derailment, G train service will be limited with single-tracked service on the Queens-bound track only between Bedford-Nostrand and Court Sq. and “extremely limited” service between Fulton St. and Bedford Nostrand. The G is, in effect, now a shuttle. The MTA is urging riders to use the B38 along DeKalb or Lafayette Avenues as an alternate, and Transit is providing free transfer from the G at Fulton St. to the C at Lafayette Ave. and from the Broadway stop to Lorimer St. on the BMT’s J/M/Z lines. F service from Bergen St. south continues to operate normally. The MTA is currently investigating the derailment, and while I have no basis for this conclusion, the incident follows a mid-afternoon rail condition near the same spot. According to MTA records, that issue had been cleared up a little after 5 p.m. on Thursday evening. More details to come. The Utica Ave. subway extension, a proposal from New York City’s history, has reappeared in the OneNY document. A bunch of years ago, then-Mayor Michael Bloomberg released his comprehensive plan for New York City’s immediate future. Awkwardly called PlaNYC, it introduced the city to the idea of a congestion pricing charge for Manhattan’s Central Business District and tied in the revenue from this fee to transit upgrades designed to secure the city’s environmental future while cutting down on crippling congestion. The centerpiece failed, but the overall master plan concept has stuck around. It was refreshed four years ago and overhauled this year as Mayor Bill de Blasio released OneNYC on Wednesday. The idea behind OneNYC is similar to PlaNYC but with de Blasio’s imprint. It is concerned with raising New Yorkers out of poverty while paying nod to growth, sustainability and resilience. While politicians sometimes hate to admit it, all four of these goals are focused around mobility, and transit necessarily has to grab the spotlight. In his OneNYC report [pdf], de Blasio doesn’t mention congestion pricing or the Move New York plan. In fact, he later claimed, perhaps to save political capital in the face of a recalcitrant governor, that he’s never read the Move New York proposal. But de Blasio did turn his attention to transit. “Reliable and convenient transit access to employment and other activities remains stubbornly out of reach for too many New Yorkers. This problem is particularly acute for low- and moderate-income residents in areas poorly served by the subway or buses. For seniors and those with disabilities, this can affect their ability to simply get groceries, or see family and friends,” the report notes. In exchange for this support, the city wants something. They always do. In this instance, the city proposes the bombshell: a study of a subway down Utica Ave. in Brooklyn. The report calls for faster CBTC adoption, new or reopened entrances that are ADA-compliant, randomly a free transfer between the Livonia Ave./Junius St. L and 3 stations, and subway-fication of the LIRR between Jamaica and Atlantic Ave. after East Side Access opens. But the Utica Ave. line is the centerpiece. The document doesn’t go too far here. The mayor wants simply “a study to explore the expansion of the subway system south along Utica Avenue in Brooklyn, one of the densest areas of the city without direct access to the subway,” and on its face, it’s exciting that someone in City Hall is talking about this idea in an official document. It is so far unclear how a Utica Ave. subway would take shape. It could involve an extension of the 4 train from the Eastern Parkway line. It could call back to Second System plans to run trains from 2nd Ave. through South 4th St. and, eventually, down Utica Ave. But there you have it. As The Times noted, this is far from the first time this idea has arisen. A Utica Ave. subway was part of the early 1900s plans for the subway and were included in expansion plans in the 1920s, 1930s and 1960s. Another study today seems like overkill, but it’s the first step toward securing funding. It’s a very preliminary first step though. The challenges being right there. One of the reasons why politicians are so hesitant to embrace these ambitious plans concerns timing. If it’s going to take a decade or more from start to finish, those who appear at the ribbon cutting won’t be those who did the heavy lifting and secured the dollars. There is no political incentive to push through infrastructure projects if the only photo op will be a staged event 18 months before the real opening date (cough cough 7 line extension cough cough). But there are other challenges too. The next concerns money. Who’s funding this subway extension? How? The last concerns priorities. The MTA has its own capital program wishlist and a 20-year needs assessment. The Utica Ave. subway featured on none of those documents, and adding it to the capital plan means more money would be required and more demands made. The MTA has identified the Second Ave. Subway as a need; the Mayor wants Outer Borough support and has plans for Utica Ave. It’s a push and pull that gets resolved through money. So that’s the plan for One New York. A Utica Ave. subway would be intriguing, but without a new and dedicated East River tunnel, it would create more a capacity problem on whichever line the extension would be a part of. It faces many, many challenges, but it’s a start. At least someone’s talking about it. So far, the panel has spent a lot of time talking about affordable housing, and I’m growing worried that their focus is wrong. Reinventing the MTA requires asking hard questions and proposing top-to-bottom solutions for streamlining procurement, cutting extremely high capital costs and improving agency operations. It’s not about using the MTA to advance city policy goals. The MTA, I would argue, already does more than anything else for affordable housing than any one agency in the city, and the early framing on policy goals rather than MTA problems bodes ill for this Commission’s future, especially when a largely unfunded $30 billion capital plan looms. Affordable housing, for instance, is an outcome of sound transit policy, and without reinvention such that subways do not cost over $2 billion per mile, the policy goals will remain elusive. On the bright side, Dana Rubinstein spoke with the Commission’s heads, and they expect results. “I don’t think any of these very busy people, any of these very important and smart people, would be involved in this if they didn’t think that these recommendations would be carried out,” Ray La Hood said to Rubinstein. Hopefully, the recommendations are expansive enough. amNY: Where is New York’s better bus terminal? The Port Authority Bus Terminal is low-hanging fruit, but it pays to remember just how sorry a spot it is. In an editorial today, amNew York urges the Port Authority to redevelop the bus terminal. “Midtown Manhattan urgently needs a brand-new, world-class bus station,” and with air rights value at an all-time high, the money to realize this dream — $500 million to $1 billion depending upon the scope of the project — could materialize. When Greenpoint’s India St. ferry stop collapsed earlier this year, everyone in the know knew that city had around four months to fix the dock before the summer shutdown of the G train for Sandy-related repairs. Now, with 11 days to go before the five-week outage, the ferry stop is not yet open, and no one knows when repairs will be complete. Brooklyn politicians are demanding answers, but concrete details are not forthcoming. This is one spot sorely in need of its ferry service and soon. For L and M train riders, this fall will bring some much needed capacity improvements during periods of high travel. 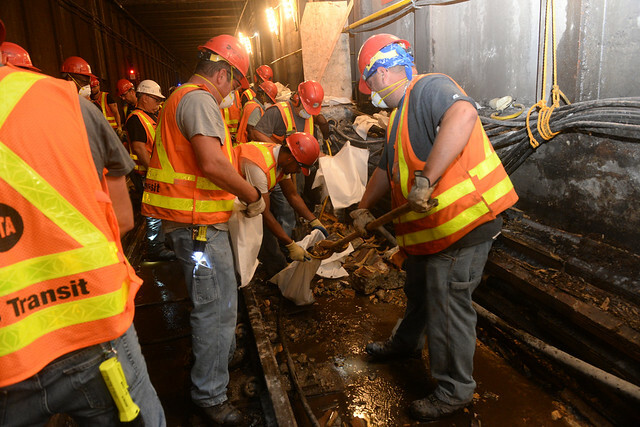 For G train riders, this summer will bring a five-week service outage along the northern segment of the line as Sandy repair work wraps, but along with this service changes comes a free out-of-system transfer for which many have been clamoring for years. As subway experiments and service patterns go, these are worth some attention. The MTA notes that these changes will cost around $1.7 million annually — a pittance for such a significant boost in service — and are in addition to the eight new weekend and weekday L train round trips that are on tap for the summer. The M train service increase will begin when the R train’s Montague St. tunnel is reactivated toward the end of October. It’s not entirely clear how the free transfer helps out those stranded by the Sandy shutdown as the J and M trains don’t go anywhere near Court Sq. (though the connection to the M will alleviate a lack of access to the E), but this transfer has always been one I believed the MTA should offer even if it meant changing their transfer policies. It allows for better connections into Lower Manhattan and the Sixth Avenue corridor as well as Brooklyn and Queens. “We realize this vital work is going to be an inconvenience for our customers and we’re happy to provide this service to make it easier for people in those affected neighborhoods,” MTA spokesman Adam Lisberg said to the Daily News. If this transfer proves popular, I have to believe the MTA would consider making it permanent. If anything, as I mentioned, it improves mobility between routes that have always crossed but never connected. That is never a bad development. Is the waterfront streetcar a solution looking for a problem? In my write-up of Michael Kimmelman’s Times column on the Brooklyn-Queens streetcar route, I posed a question that would be answered by any study examining this proposal: What problem does this light rail/streetcar line solve? Intuitively, it seemed as though the biggest problems were at either ends of the line — Red Hook and Astoria — and the idea of an interconnected waterfront was otherwise a developer’s dream masquerading as a solution to something that isn’t actually a problem. One of the biggest issues though with Kimmelman’s argument is that most of the Brooklyn-Queens waterfront isn’t really that far away from the nearest subway (let alone feeder bus routes). I did some radius mapping tonight of the waterfront and various other areas in Brooklyn and Queens, and the resulting images are instructive. I cannot unfortunately embed the map so you’re stuck with some images. 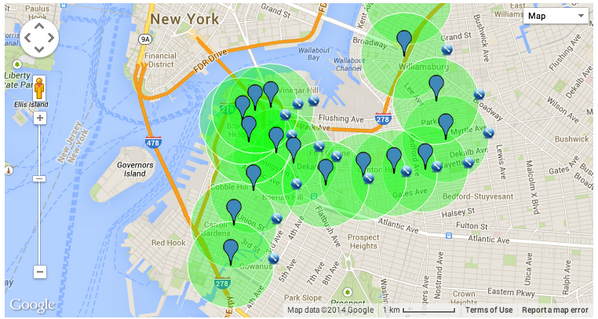 Take a look at what happens when you chart areas that are more than half a mile away from the nearest subway. In Brooklyn, Red Hook and Navy Yards are far from the subway. 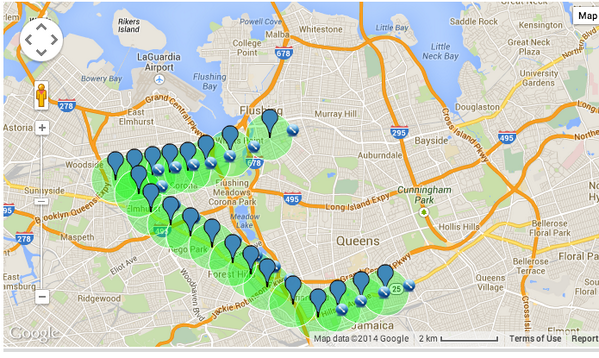 In Queens, parts of Astoria are a trek away from the nearest subway stop. If we’re truly concerned about getting people from transit deserts to jobs, then there are three discrete problems: The Navy Yards, an actual job center, isn’t close to transit while Red Hook, where low income housing dominates, is physically and psychologically isolated. Finally, in Astoria, parts of the waterfront are far from the N and Q trains, but there is an area where a ferry would make more sense as a lesser cost option. The truth is the waterfront is not, by and large, without access to transit, and the G train, as scorned as it is, provides an adequate crosstown connection. A shorter streetcar route could help solve Red Hook’s problems and make the Navy Yards more attractive; a long streetcar that snakes past luxury developments that are a 10-minute walk from the nearest subway seems like more of a bonus for developers than a solution to a problem. But it’s still worth studying, objectively and thoroughly, and then when we have cost estimates and ridership projections, we can talk. As an object of desire though, it leaves much to be desired. For fun (? ), I have two more screenshots of the radius maps. 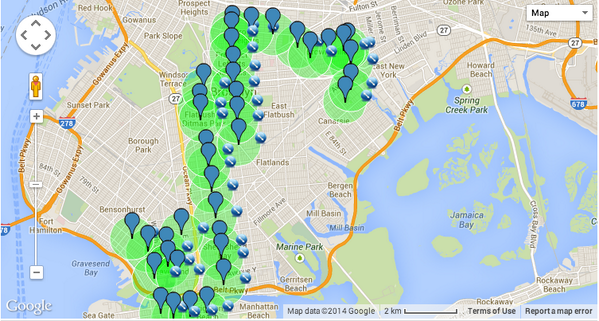 Take a look at South Brooklyn and Eastern Queens. Forget desire lines and the developing waterfront; these are massive areas of the two most populous boroughs where the nearest subway connections are miles away. No one seems interested in solving that problem though. Lots of highways but no subways for eastern Queens. Forget about catching the train in South Brooklyn (or East New York for that matter). As 2013 unfolded and the promise of a new mayor came into view, the Forum for Urban Design hosted a series of meetings on urban development. As part of the forum, a variety of planners and designers submitted ideas for the Next New York. I highlighted one of those ideas — Alex Garvin’s waterfront light rail — in a September post on light rail for Red Hook. It is, of course, an old idea that won’t fade away and could make sense as a speedier connection to the jobs, shops, restaurants and subways in Downtown Brooklyn if the costs are right. Today, that idea — and the rest of Garvin’s impractical line all the way to Astoria — is back in the news as The New York Times has discovered it. It’s always dangerous when The Times latches onto an element of urban planning as they tend to push real estate interests over transit needs, and their coverage of this idea as a mixed-traffic streetcar connecting waterfront areas that don’t need to be connected to each other follows a similar pattern. This is a Big Idea for the sake of Big Ideas and not to solve a discrete problem. There’s a wonderful term for the dirt trails that people leave behind in parks: desire lines. Cities also have desire lines, marked by economic development and evolving patterns of travel. In New York, Manhattan was once the destination for nearly all such paths, expressed by subway tracks that linked Midtown with what Manhattanites liked to call the outer boroughs. But there is a new desire line, which avoids Manhattan altogether. It hugs the waterfronts of Brooklyn and Queens, stretching from Sunset Park past the piers of Red Hook, to the Brooklyn Navy Yard, through Greenpoint and across Newtown Creek, which separates the two boroughs, running all the way up to the Triborough Bridge in Astoria. The desire line is now poorly served by public transit, even as millennials are colonizing Astoria, working in Red Hook, then going out in Williamsburg and Bushwick — or working at the Navy Yard, visiting friends in Long Island City and sleeping in Bedford-Stuyvesant. They have helped drive housing developments approved or built along the Brooklyn waterfront, like the one by Two Trees at the former Domino Sugar Refinery. But this corridor isn’t only for millennials. It’s also home to thousands of less affluent New Yorkers struggling to get to jobs and join the work force. So here’s an idea: bring back the streetcar. The idea of a “desire line” is a literary device; it doesn’t mirror reality. Furthermore, the rest of Kimmelman’s column is replete with contradictions about this streetcar’s plan. Kimmelman opts for streetcars over buses because of “romance,” but and while there’s something to be said about the psychological impact of a streetcar, we’re talking about a half a billion dollars and massive upfront infrastructure needs for a mixed-traffic line that won’t do what Kimmelman wants it to do. While Cap’n Transit believes that any area that could support light rail would be prime for a subway, if costs are lower and ridership falls in between buses and a subway, light could work. As I mentioned, we can’t dismiss the psychological edge they hold over buses, and with the right routing — dedicated lanes that run, say, from Red Hook to the Navy Yards via subway stations in Downtown Brooklyn rather than via the waterfront — they could solve the gaps in transit deserts. But we shouldn’t, as Deputy Mayor Alicia Glen does, love this idea simply because it’s new, romantic or big. Will the ridership justify the costs? Will the service connect to job centers and destinations or provide a faster way to get to New York’s developed subway network? Can we identify a need and support that need based on a thorough study? “Desire” isn’t enough considering how much this will cost.